This pillow is made with ecru moire fabric. It has a sweet silk print of a little girl standing by a chair, the print is trimmed with Venice lace. The pillow is trimmed with ecru eyelet. 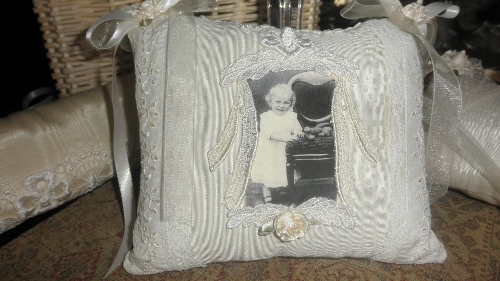 Other embellishments are ecru sheer ribbons and tiny cream colored rosebuds. This would be pretty hanging in a little girls room.